I do a lot of research for this blog and as I come across great ideas I love sharing them. 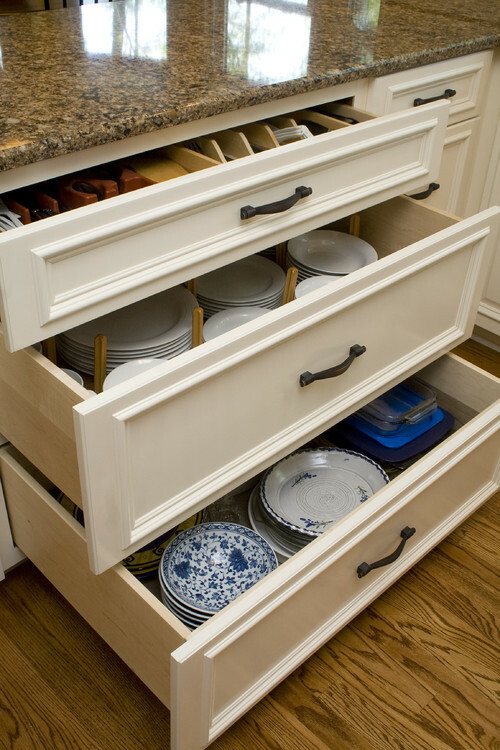 Finding clever storage ideas for your home is always fun and helpful. 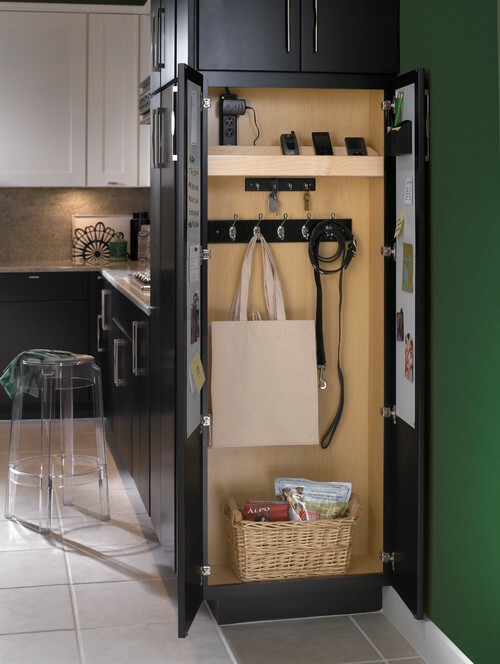 If you're looking for remodeling ideas or creative solutions for storage, you're sure to find an idea here to inspire you. 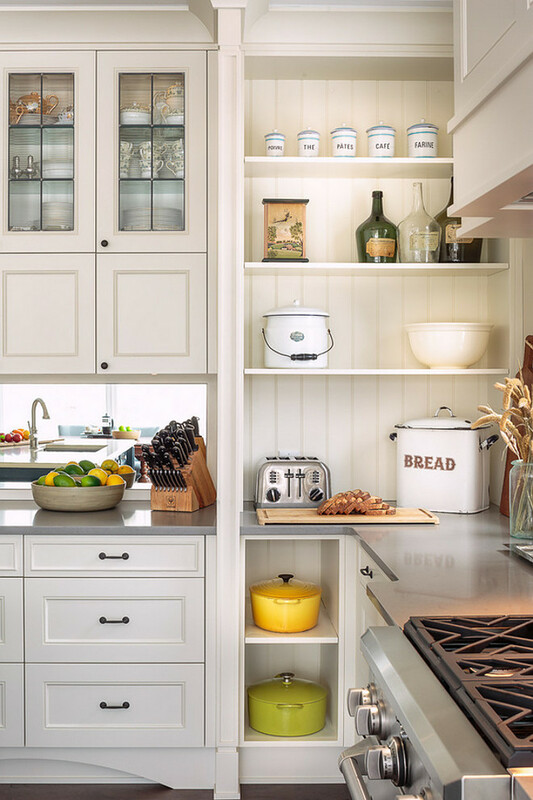 This kitchen design utilized a combination of open shelves and cabinets to store dishware and display a collection of vintage pieces. 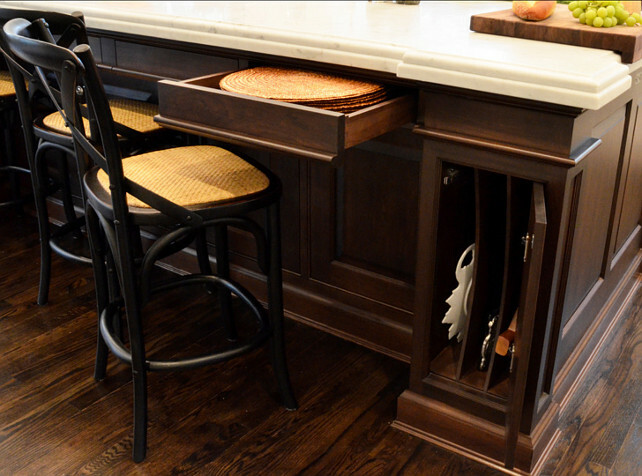 Gotta love islands that make the most of storage options with hidden cabinetry and drawers for additional storage. 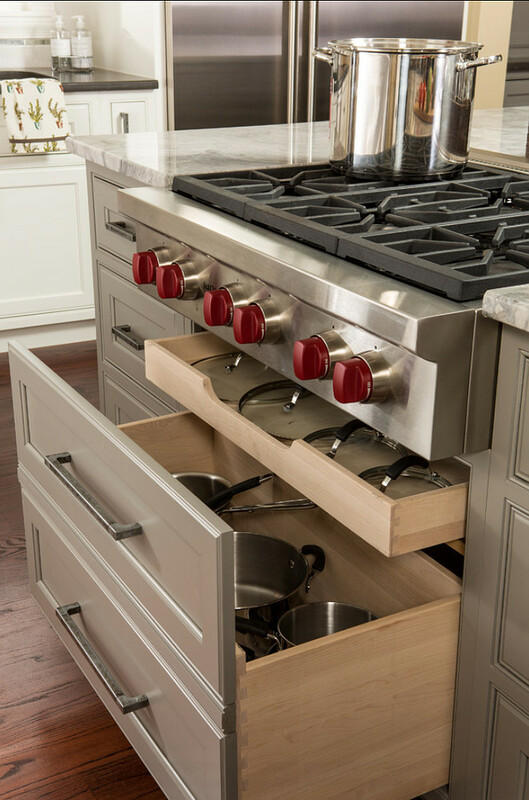 See more of the great storage options in this kitchen HERE. 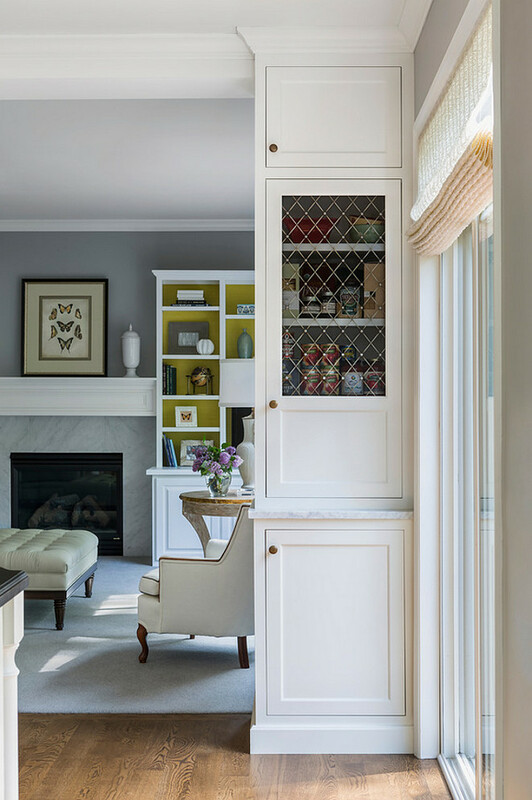 This kitchen pantry cabinet was placed between the kitchen and family room to add more storage space to this kitchen for a very practical and beautiful idea. 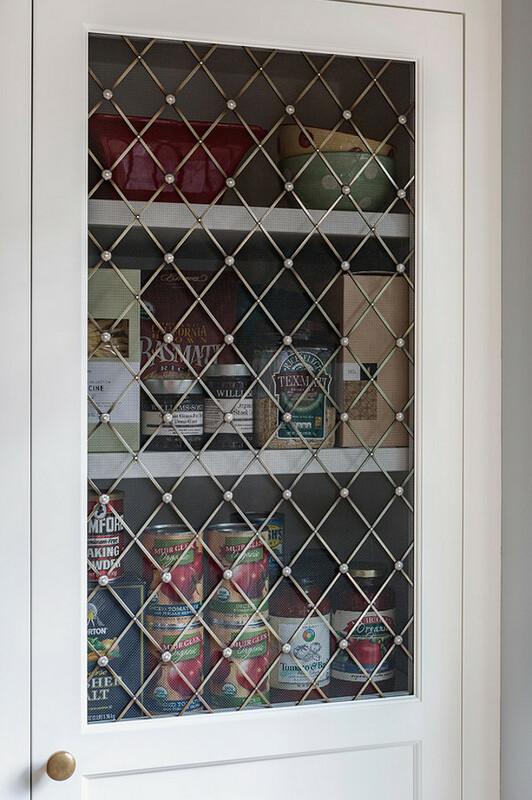 I love the wire mesh cabinet door. It adds a lot of style and a designer touch. 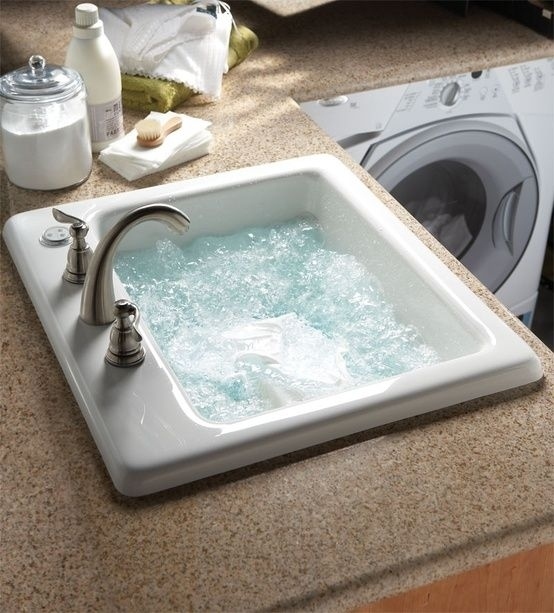 I love having a sink in the laundry room but adding this small feature is insanely creative. 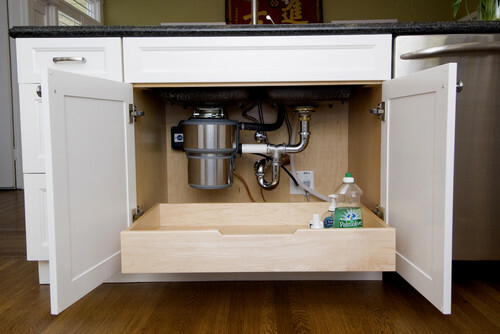 Put a sink with jets in your laundry room so you have a convenient place to wash your delicate clothing. I don't know how it is around your home, but one thing I'm tiring of is cords strung along my counters and hunting for power cords to charge phones and tech equipment. 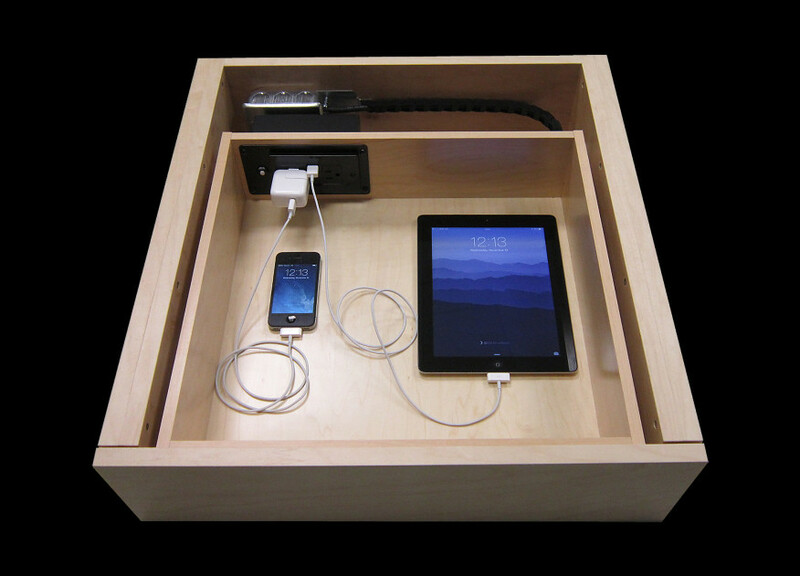 Resolve this issue with one of these inspiring ideas for a charging station. 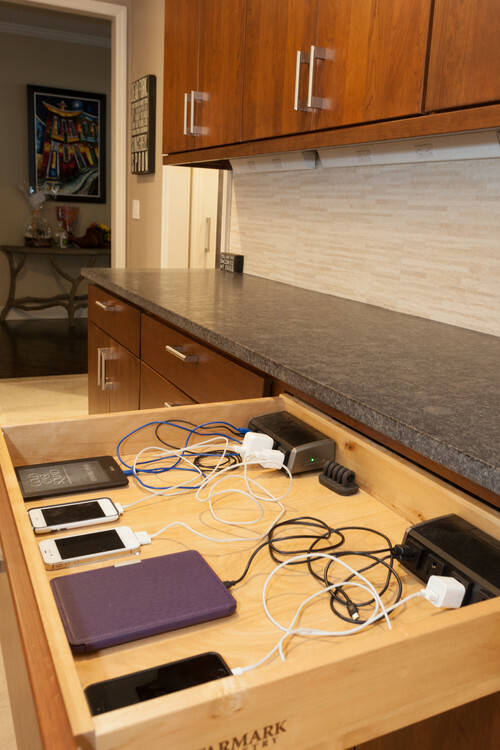 A charging station can be incorporated into a drawer, cabinet or on a countertop to keep equipment organized and charged. 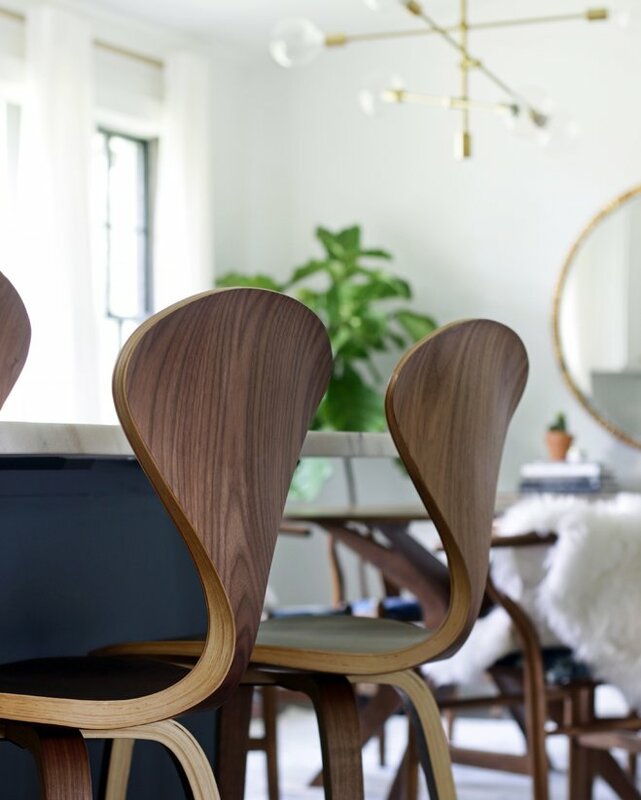 Whether it is part of new construction or you add your own, here are a few ideas for inspiration. 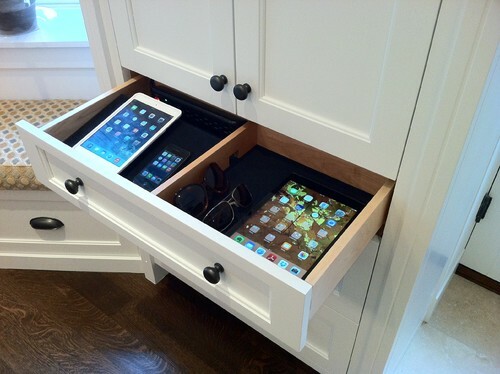 The drawer above was incorporated in a drawer of a cabinet off the family's mudroom. 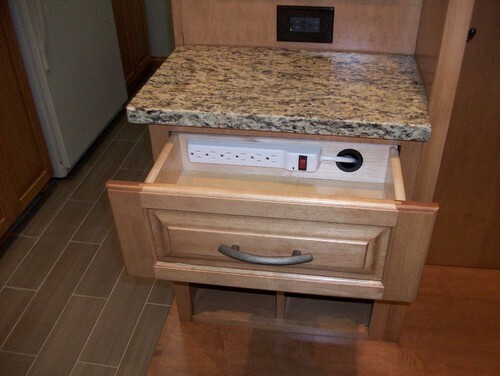 There are recessed outlets in the back of the cabinetry and the cords are retractable when the drawer is opened and closed. The actual charging device is from Home Depot. 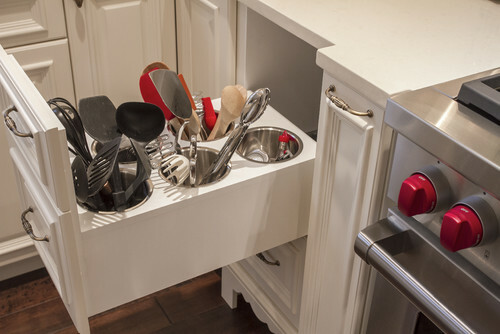 More are more homeowners are opting for creative solutions to eliminate some of the clutter from countertops and using every inch of space in the kitchen for storage. 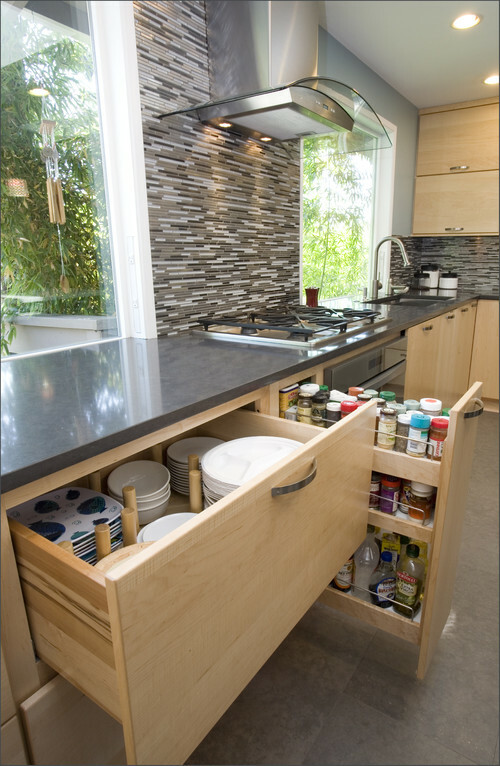 Here are a few wonderful kitchen storage solutions. 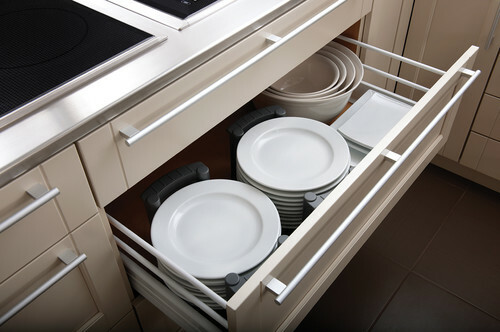 Popularity for pullouts and deep drawers increase as an efficient solution for storing dishes, pans and kitchen essentials, especially with more homeowners trading in upper cabinets for other ideas. 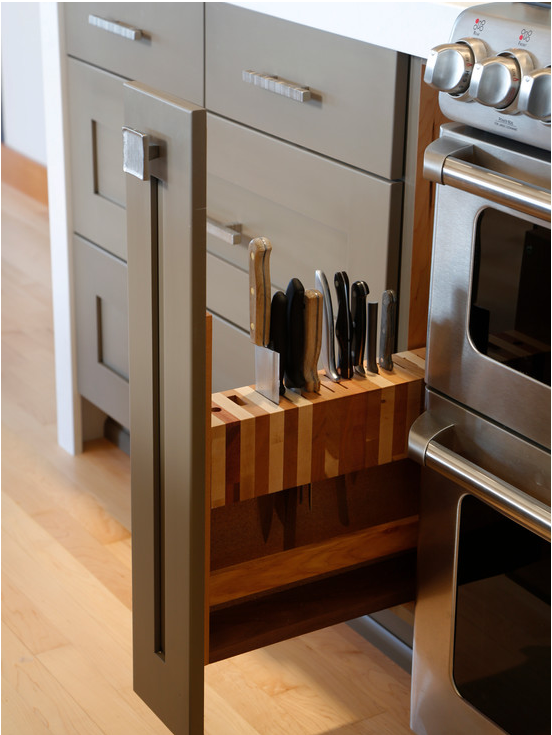 This is a nice idea for storing those hard-to-store cookie sheets and muffin tins. 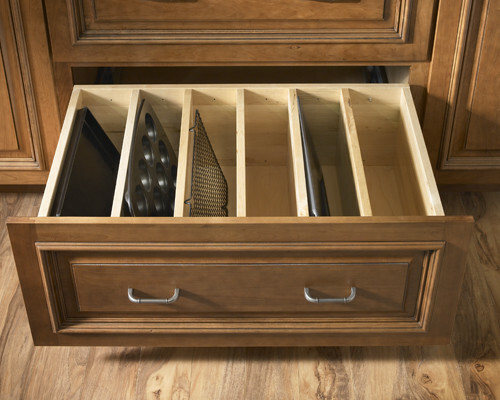 These drawers are from Rev-A-Shelf and can be installed after-market. 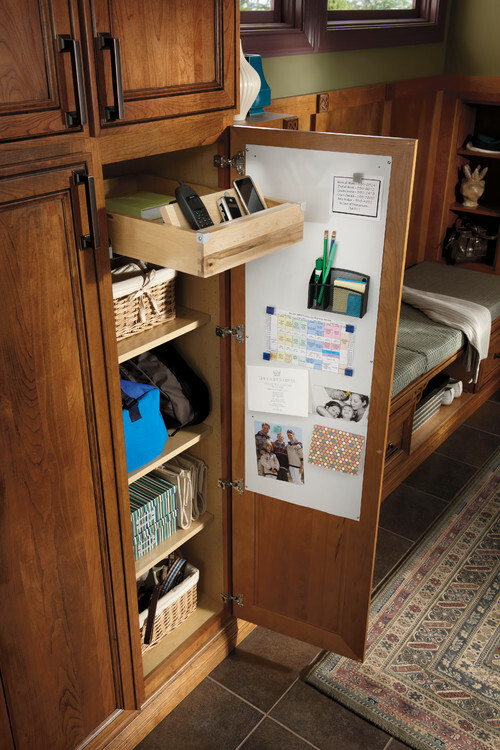 See HERE for more great storage options by Rev-A-Shelf. 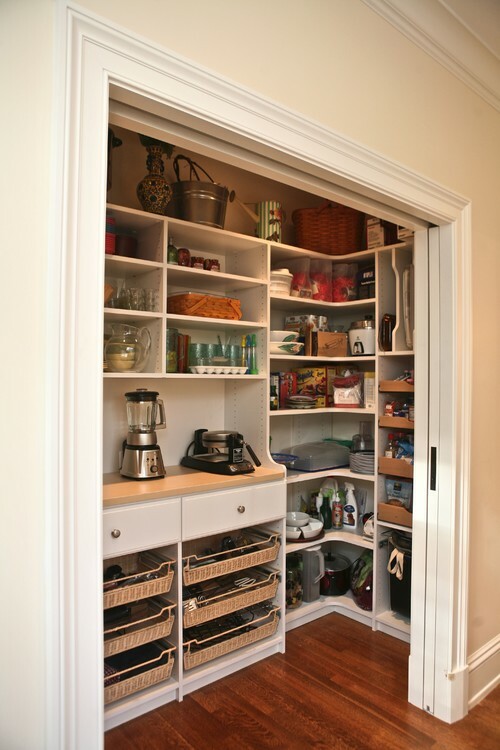 Clean out and transform a closet into a kitchen pantry using organizers and shleving. Isn't this an organized and efficient use of space? 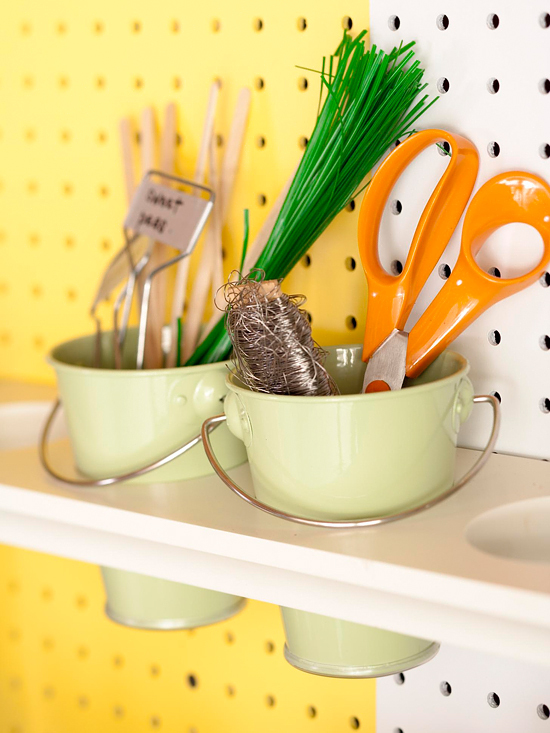 The petite spice canisters you find for the kitchen are perfect for storing screws, nails, and washers. The clear lids make it easy to see what's inside. 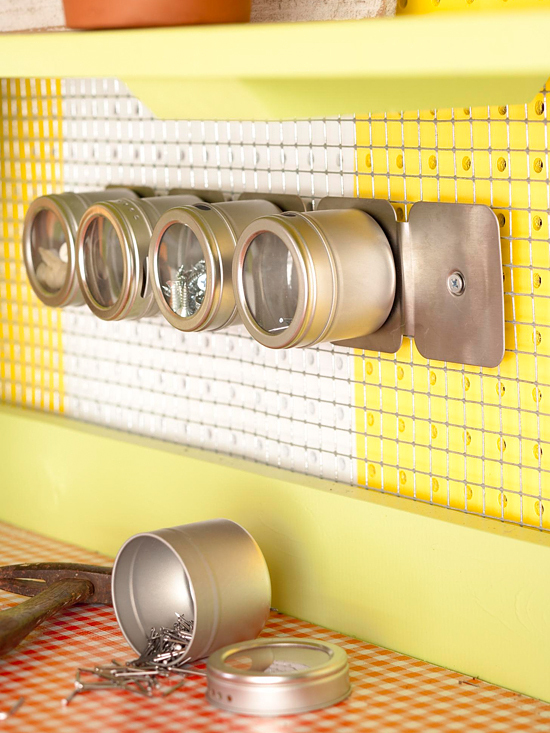 Mount a magnetic panel to a pegboard to hold the canisters when not in use. Here routed holes in a wooden display shelf is used for a convenient place to store miscellaneous items such as scissors and other small items. These small buckets are well-suited for the task, and they add instant charm and accessibility. 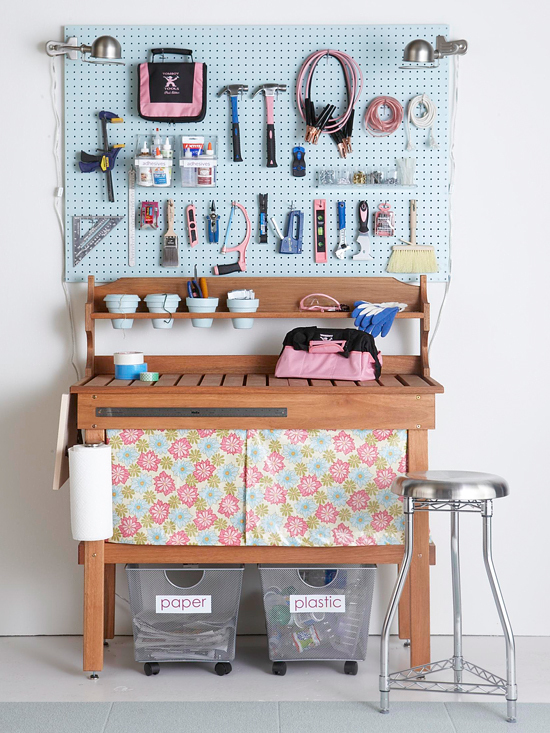 Or transform a traditional potting bench to make a complete workstation. It combines different storage solutions and provides a large surface area for working. We use to take our dog to a "dog wash" that looked very similar to this. 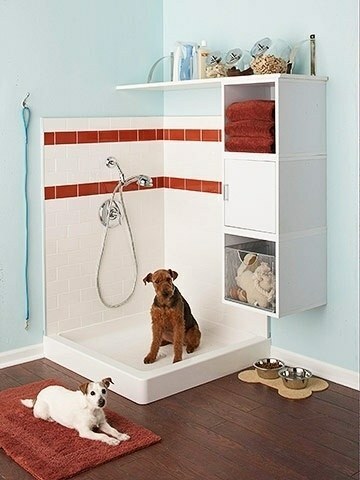 How nice for pet lovers to convert a corner of a garage with a convenient dog wash shower. I really like this idea. Have a nice day!